school in London. After the death of both his parents, Thomas decided to finish his schooling by studying canon law. He was successful in his studies and was made secretary to one of the courts of London. After working for a while at law, Thomas decided to dedicate the rest of his life to God, and began to work towards ordination. In all that he did, Thomas diligently applied himself and became well known as a holy and honest worker. His work came under the scrutiny of King Henry II and, in 1157, Thomas was asked to serve as Lord Chancellor to the king. After the bishop of Canterbury died, Henry sought to elect Thomas to the position, and in 1162 this suggestion was accepted by a synod. Thomas warned the king that it might cause friction and conflict of interests, but accepted the position. 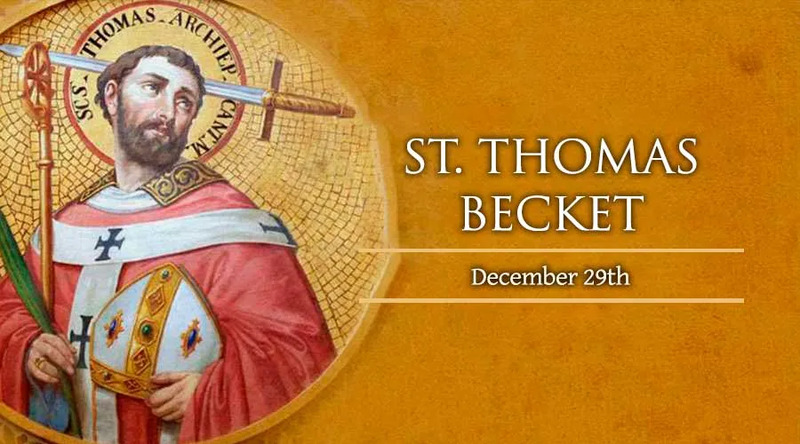 Thomas served as bishop by seeking to help the people and develop his own holiness. He practiced many penances and was very generous to the poor with both his time and his money. As Henry's reign continued, he began more and more to exercise his hand in Church affairs. This caused many disagreements with Thomas, and after one especially trying affair, he retired for a while to France. When Thomas returned to England, he again became involved in a dispute with the king. Some of the king's knights saw this as treason, and as a result they killed Thomas in his own Church. Henry did penance at the grave of Thomas, seeking forgiveness for the actions of his knights, and the tomb soon became a place of pilgrimage for the faithful.